We had a lot of the semi flexible panels fail with wide cracks showing on at least one module in each panel. At first we put it down to the uneven expansion pulling the modules apart, but then after another lot failed that weren't glued down to the Themoclear we stumbled upon the reverse current flow problem actually heating the weakest modules until they failed. We fitted blocking Schottky diodes in the positive panel cables and that appears to have solved the problem. Well, we sure hope it has anyway, it costs us a lot of money and time replacing all the failed panels so it was a very expensive learning curve. It will be interesting to see if the glued down panels with blocking diodes fitted survive for more than 12 mths, that was they will have been through all the seasonal temperature variation that could cause the expansion cracking the modules or if that theory is now debunked. I'd actually used some "JCB Joint Connector" bolts and matching Barrel Nuts from Anzor Fasteners to connect my panel to its square-section aluminium frame so I will repurpose these..
Interestingly, my experience with the Armourflex has not been that wonderful. The one panel I've glued to the Thermoclear has started to separate from the Thermoclear already. The Armourflex bead has remained stuck to the back of the panel but seems to be separating from the Thermoclear quite easily. I've picked at one of the beads on the back of the panel with my fingernail and it seems it won't be too hard to pick off. In any case, today I tried using the panel, feeding its output through a Morningstar Sunsaver Duo PWM regulator into two AGM batteries. 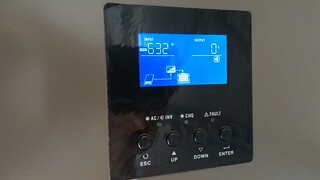 I saw up to 20.9V from the panel and current between panel and controller started at 5A and quickly dropped to about 3.5A. Unfortunately, this was all around 3:30pm so while the panel was at right-angles to the sun, unshaded and with clear sky, the sun was obviously fading as time passed. Also, I only had the one volt meter so I couldn't measure voltage and current at the same time, I had to re-jig the wiring in between. However, at one point, I did measure the panel surface temperature at 65°C (using a Benetech GM300 Infrared Thermometer), this was around the time the current had dropped to 3.5A. Unfortunately I'd not measured it when the current was at 4.5-5A. However, I think it is possible that the Thermoclear is not cooling the panel as much as it might. I note that the glue bead is causing a 1-2mm separation between Thermoclear and panel wherever there isn't glue so maybe that's preventing effective heat transfer away from the panel? As I mentioned earlier, I think that for several reasons, I should split this panel from the Thermoclear if I can do it as easily as seems likely, remove the glue and try bolting it together instead. Lay the panel and thermoclear in the sun, it will pass 70*C where the Amourflex meets the thermoclear and let go if the glue is more than about 2mm thick. Lift the corner, the foot placed on the Thermoclear and carefully lift the panel off the Thermoclear, just make sure you do create any tight radius curves. When the modules are warm/hot they are quite flexible so very little risk of cracking/breaking them, but careful as you go and they will separate easily. Use a sharpened scraper to carefully remove the Armourflex from the back of the panel, again, much easier when it is hot. Clean the remainder off with turps and revert to the free contact method for heat transfer to the Thermoclear. Thanks Terry, I managed to separate the two last night, carefully working my hands between the Thermoclear and panel without any curves. I'd avoided any more sun on the panel fearing it might cure the Armourflex further but I'll definitely use the sun to help get the glue off the back of the panel now. I had been using a sharp, broad chisel which seems to work quite well: some of the Armourflex comes off quite easily, some is very well stuck so hopefully heat +/- turps will help with that. I know the percentage loss is for total power, not just the Vmp, so the math is vague at best, but you get the general idea. The graph for the 150W panel indicates the peak power output drops ~10% every 25DegC above 25DegC. On a clear sunny summer day in Australia if you can't take a panel from inside at 25DegC then outside facing at the sun and not get with 5-10% of the rating to me this sounds like a consumer law issue. I'd be P'd off if I only got 60%. Are you sure that you are actually loading the panel up after the MPPT to get the full peak rating? It does meet specification, the specification is under the STC test conditions and if you duplicate those test conditions you would most likely get a similar figure give or take a few %. The sly trick the solar industry has used for ever is to not give true output figures in a real world application. Even the NOCT (Normal Cell Operating Temperature) specs are not real world with a 20*C ambient temp and the manufacturer can cherry pick the cell temperature as long as the specify just what that temperature is. The real laugh is the MPPT controller mob ran with the bogus STC figures and came up with claims of a 30% harvest increase without actually testing that they could achieve such figures in the real world. They simply duplicated the STC figures with a power supply and designed a circuit that would improve the harvest over and above that of a PWM controller using the same lab base equipment. In reality in the harsh Australian conditions that solar operates in, the MPPT controller's only advantage is the higher solar voltage gained by a series string of solar panels on the supply side means the cabling can be smaller. Side by side testing using adequate cabling, parallel connection and PWM control of solid state relays against an MPPT controller with exactly the same number of panels connected in series shows the PWM set up outperforms on an instantaneous basis as well as over the full days harvest. This test rig is on an off grid set up in Crystal Brook SA and has been running continuously for 18 mths now and the PWM system still outperforms the MPPT with both systems charging a 15.5kWh lithium battery pack. The sly trick the solar industry has used for ever is to not give true output figures in a real world application. Except the bit where they try to comply with international standards IEC 60904. Not surprisingly there are massive PV testing machines for IEC 60904. In Australia we can get over 1000W/m2 in summer on a clear day at midday. So regardless of what exact STC they used you should easily get the rating in "our" real world conditions as they are more favorable. As Chris pointed out with his panels pushing more than their rating. I think the phenomenon Chris witness was cloud edge effect where the 1000w/m2 is well and truly exceeded, much the same was as a very fine hazy cloud day near water or snow. If you get panels that output more than their nameplate value on a hot clear sunny day with no reflected sun, you have panels that were incorrectly labelled The solar industry lives in purely optimistic world where theory and reality are worlds apart. Been doing this stuff for a long time and I very rarely see anything that comes up to the nameplate rating, the semi flexible panels would be about the only cases and then only when combined with lithium batteries that can take in all that can be dished out. I do not think the international standards IEC 60904 particularly suits the testing of these semi flexible panels for some reason because the STC rating is often exceeded in the real world in optimal conditions, rigid panel never live up to the STC ratings without the assistance of extraordinary conditions. Well I'm curious to test this for myself. I have a variety of panels brands+sizes I can check. I don't have any semi-flex ones tho. I'm in WA at the moment in the Brunswick area. I hope to be heading toward the Perth area later in the week. 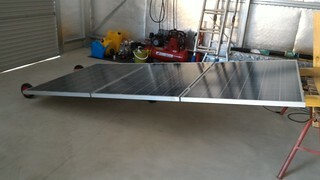 Maybe a chance to catch up and you can check out my rather rushed solar install on my Hino bus/motorhome. 1620w in total, 6 x 270w Tindo solar panels connected in parallel charging a rather aged and abused 180Ah 24v Sinopoly lithium battery bank. That would be great if we can make it work, PM sent. To update our panel saga, over the Oz Day long weekend we were away in our van and had plenty of time to test out our two panels under a variety of conditions, mostly optimal for solar power generation with clear skies and plenty of cooling breezes, and compare one panel with its old home-made aluminium frame and one with its Lexan Thermoclear backing. Remember first that, unlike Terry's setup, these panels are mobile, usually propped up as close as possible to 90°to the sun. We found there was never any significant difference between the output from the two panels. I suspect that with the panels propped up, there is enough convection airflow over the back of the ali-framed panel to match any cooling effect from the Thermoclear backing on the other panel. My wife found the thermoclear-backed panel much more difficult to grip and manhandle so I have now returned it to its old ali frame. For the record, over that weekend we saw up to 80W briefly from each panel when first put out in the sun "cold" in the morning but this always fell over the next 5 minutes or so to about 50W. To save you going back to look it up, these panels are rated at 134W each. It was very windy most of that weekend where we were camped and while we were lucky enough to be in a relatively sheltered spot, there was plenty of air movement around the panels. I think it is safe to conclude that these panels seem to suffer quite significant thermal de-rating (nearly 40% reduction for us) despite any convective cooling effects. We have arrived back home after our trip to WA in the Hino with the 6 x 270w Tindo house type solar panels flat mounted on rails mount to the roof. Looks kinda agricultural, but it worked better than we expected. 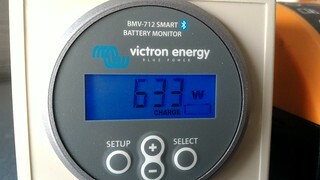 The very best output we saw was 60 amps @ 26.6v or 1596w, not bad from 1620w of solar. It held that for maybe 5 mins while the air con was running flat out and using every bit it could get, but once it started to wind down the power demand the voltage went up and the current dropped back to around the 50 amp mark until the 28v or 1400w end of charge was reached. With this array charging a rather badly treated 180Ah Sinopoly battery pack we ran all our usual electrical appliances including the aged 300ltr approx. fridge through a PIP 2425 2500w inverter running 24/7. We needed the inverter running over night for both the fridge/freezer and my wife's CPAP machine so she didn't snore in my ear all night. Just wish the rest of the beast had been so well behaved. The alternator threw in the towel, the injector pump appears to have a governor problem resulting in a max speed of 90km/h down hill and 40km/h up hill and anywhere between those two on the flat and the heat during the day was more than the cooling system could handle. Thank goodness for the solar and lithium battery pack so we could provide the 24v to run the vehicle as well as the air con to cool the bedroom. We played tag team driving all the way home, one recovering under the air con while the other melted up front steering the thing. While I agree that the factory test conditions don't represent real world conditions over the day. It's a starting reference point for comparison and I haven't had issues obtaining similar results even from well used( 10 years old+) 2nd hand rigid poly Chinese panels. Clean panels, clear day, tilted at 90 deg to the sun charging a well discharged lithium battery with short cable runs little wiring resistance losses will see the listed output spec until the panels heat up. It's not uncommon for me to see well over the specs for a short time when I first set up the temporary panels late Moring (They are used to provide temporary AC power while building my offgrid house so I manually track the sun over the day when I can) They are cool panels in the morning as they have been stored in the shed cool and just wheeled outside and propped up to face the sun. That said as they heat up output tapers off though as long as it's not to hot over 500w or around 80% of the rated output is typical.